Venezuela President Nicolas Maduro on Wednesday said that authorities are “on maximum alert” over alleged US-approved plans to send paramilitary deaths squads from Colombia to carry out violent attacks in the joint border region. “They want to infiltrate armed groups trained by Colombian paramilitaries because from the north has come the order to, in whichever way, destroy the homeland of [Simon] Bolivar,” the general who liberated Colombia and Venezuela from Spanish rule in the 19th century, Maduro said. According to Maduro, the paramilitary force aims to “bring violence” to the border states of Zulia, Tachira and Apure. The already barely stable political situation in Venezuela deteriorated earlier this week after security forces killed a 14-year-old boy during an anti-government protest in San Cristobal, a town only miles from the Colombian border. Following the death of the teenager, dozens of masked protesters faced off with security forces and were burning garbage and tires, according to the Reuters news agency. In the western city of Maracaibo hooded individuals burned a truck carrying medicines, said Maduro. The accusations of Colombian interference in Venezuela’s ongoing political tensions between supporters of the government and the conservative opposition are not new. Maduro and his predecessor, the late Hugo Chavez, have regularly claimed there exist conspiracies by the US government, Colombian conservative political forces and the Venezuelan opposition to overthrow the leftist administrations that have been ruling the South American country since 1999. In November last year, Colombian authorities arrested a dual Colombian-Venezuelan citizen who has been accused of assassinating a Venezuelan deputy. In 2013, the Venezuelan government arrested nine Colombians who were accused of plotting to kill Maduro. Dozens of Colombians have been deported from Venezuela over the past years, in some cases over accusations they were criminals. 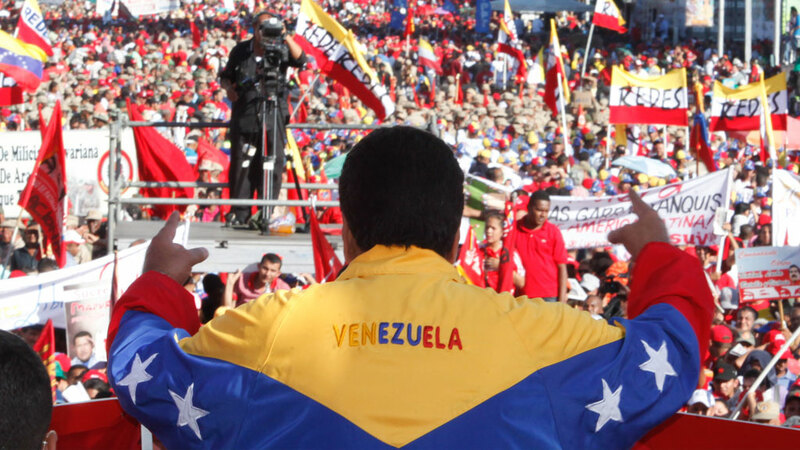 Are Colombians involved in Venezuela’s instability? Colombian illegal armed groups, including organizations like the Urabeños and the Libertadores de Vichada that were formed from the remnants of the now-demobilized paramilitary organization AUC, have been active in illegal activities along the Venezuelan border. The country has also provided refuge for drug-trafficking guerrilla groups like the FARC and ELN that were pushed to the periphery of the country in a US-backed military offensive in the first decade of this century..
Over the years, Venezuela has become a key drug trafficking corridor from Colombian cocaine that is trafficked from central Colombia to Venezuela in order to be sent to major drug consumption markets in the United States and Europe. While no evidence has ever been found of political activity of Colombian groups in Venezuela, former members of the AUC have claimed they did have the intention to operate in Venezuela. According to a top commander of the AUC, the paramilitary group that demobilized between 2003 and 2006 sought to cross the border in order to fight guerrilla forces that were carrying out hit-and-run attacks on Colombian targets from Venezuelan territory. One former Colombian military/paramilitary commander testified in 2012 that the AUC was involved in the planning and execution of a failed Venezuelan coup d’etat in 2004. The United States has also denied involvement in Venezuela’s current instability. While Colombia’s conservative opposition has consistently expressed support for the Venezuelan opposition and has denounced human rights violations and alleged arbitrary detentions of opposition activists, Santos has tried to maintain quiet. Former President Alvaro Uribe‘s opposition to the government of his then-counterpart Chavez spurred the latter to shut down trade between the country, costing the Colombian treasury billions of dollars per year. The trade stop caused major economic problems for the border communities of both countries. However, after Maduro began restricting cross-border travel and trade over contraband allegations, and the economic and political situation in the neighboring country worsened, Bogota began raising concerns about human rights violations and the arrest of opposition politicians in Venezuela.